Morse was the FIRST company to earn MHEDA's, prestigious MVS (Most Valuable Supplier) award. We demonstrate our commitment to customer service, quality safety-conscious products, industry advocacy, continuing education and business networking. Morse is "The Specialist in Drum Handling Equipment." We provide 55-gallon (210 liter) drum handling solutions, such as hand drum trucks, mobile drum handlers, forklift attachments including heavy-duty models capacities up to 2500 Lb. (1136 kg). Many models are available in stainless steel. Morse drum rotators provide a method of mixing ingredients right inside a drum. We also offer our PailPRO TM line of 5-gallon (19 liter) pail handlers. Manufactured in the U.S.A. since 1923. . . 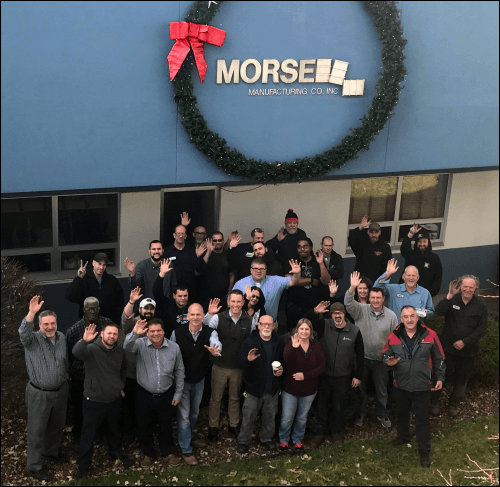 Since 1923 Morse Manufacturing has been dedicated to giving you more - and in today's world of increased domestic and international competition you should expect more. What can you expect from Morse Manufacturing? Expect personal attention from one of our customer representatives. Visit the Company Directory, give us a call and let us get to know you personally. If you have a technical question, expect to speak with one of the design engineers. We strive to make sure you get the product that meets your needs. 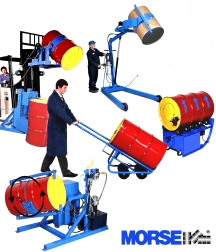 Morse offers the most extensive line of drum handling equipment. If one of our standard drum handlers doesn't meet your needs, please give us a call. Our custom design and manufacturing capabilities enable us to offer a drum handler built to your specifications. Every Morse product design is professionally engineered in-house to exceed industry standards. Have you seen the foreign products that look like Morse? Know with confidence who designed the original that others try to copy. We are so confident in our products, our skilled employees, our certified welders, and our production process that we offer a 2-year warranty against all defects. Manufacturing ergonomic drum handling equipment in New York State, we offer a variety of drum handlers to lift, move, rack, weigh and pour drums... drum trucks, drum dollies, drum palletizers and forklift attachments. Current and informative product literature and parts diagrams, as well as detailed specs on all Morse drum handling equipment. We labor tirelessly to keep our literature and website content up-to-date with any product introductions or changes. With a more than 80 year history, you can expect us to provide you with replacement parts or product upgrades when you need them in the future - 5, 10 or 20 years from now. 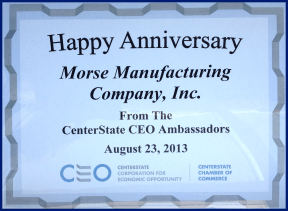 Morse is committed to manufacturing our products in the USA. Thanks for considering Morse for your drum handling equipment needs. Please feel free to contact us. The Morse Mfg. plant and resources include skilled employees and certified welders, CAD, computer controlled machining, and proprietary technology developed through more than 80 years of experience. For a Morse Drum Handling Equipment Dealer in your area, please call or email us. Please contact us for additional literature and product information. See our Literature page to print a drum handling equipment catalog or spec sheets.